Who is Sarah van Gelder? Where is Otter Creek, and Where Would That New Strip Mine Go? This morning, I drove down the Otter Creek Valley in Montana to see where the proposed mine I’ve been researching would be located. More than a billion tons of coal would come out of this new strip mine, be put on train cars on a new railroad spur, and be shipped on open train cars… Read More Where is Otter Creek, and Where Would That New Strip Mine Go? Read Sarah's Column at YES! How can you create the Revolution Where You Live? Visit PeoplesHub and sign up for trainings on building community power. Gar Alperovitz, author of What Then Must We Do? Enter your email address and I'll let you know when there's something new. 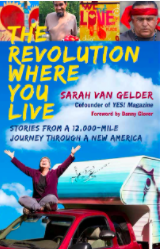 Contact Sarah van Gelder Invite Sarah to speak at your conference, or be a guest on a radio or television program.